Selling put options for income is an interesting way to generate returns in any portfolio for investors who understand the risks. Let’s take a look and see why selling put options actually has a lot of similarities to successful insurance companies and why selling put options often outperforms buying them. New accounts at Ally Invest get free trades for 90 days or $200 in cash with qualifying deposits. Plus, with commissions starting at $3.95, Ally Invest is the best and cheapest online broker to sell put options. Before you even think about selling options for income, you must understand the risks. Short call options can never be covered, because stocks can theoretically go to infinity. Although this is extremely rare, there have been several stocks in history that have gapped up over 100% to 300% overnight. If a stock trades up this much in a short period of time, it would absolutely decimate a short call position. On the other hand, short put options always have a defined risk, because stocks can never trade below zero. This technically means selling put options can be considered less risky than selling call options. Nevertheless, if a stock goes to zero, a short put position would be in deep trouble. Granted, it won’t be as bad as a stock tripling overnight, but the losses will still be severe. By now, you might be thinking, why on earth would anyone want to sell put options if the risks are so severe? The primary reason sophisticated traders prefer to sell options in general, as opposed to purchasing them, is due to the high probability of profit when selling options. Options that are far out of the money have a greater probability of expiring worthless than expiring with intrinsic value – this is a very important concept to understand. For example, take Microsoft trading around $94 per share. A typical option chain would look something like this. All of these call and put options will expire in 36 days. The price of Microsoft in 36 days will determine if these options expire worthless or with intrinsic value. Let’s look at the $90 put options with a “bid” of $1.04 and an “ask” of $1.06. The current market price, i.e. mid-price, is $1.05 which is $105 per contract. Remember, one option always equals 100 shares, so the price mid-price of an options is always multiplied by 100 to get the actual dollar value. Assuming you sold 10 $90 put options for $105, if Microsoft is not trading below $90 in just 36 days, you will make $1,050. Essentially, Microsoft can trade down 4.5% in 36 days and the short put options will still be fully profitable. For the short put options to be a losing trade, Microsoft would have to crash more than $5 per share in 36 days. From a technical point of view, a bluechip stock declining this much in less than a month of trading days is relatively unlikely. This is why selling put options for income works. For it not to work, MSFT would have to decline substantially in a specific time period. Let’s take a look at the trading history of Microsoft for the last six months. In the past six months, there was only one time when Microsoft declined more than $5 in a given 36 day period, and this was during one of the most violent stock market selloffs in three years! 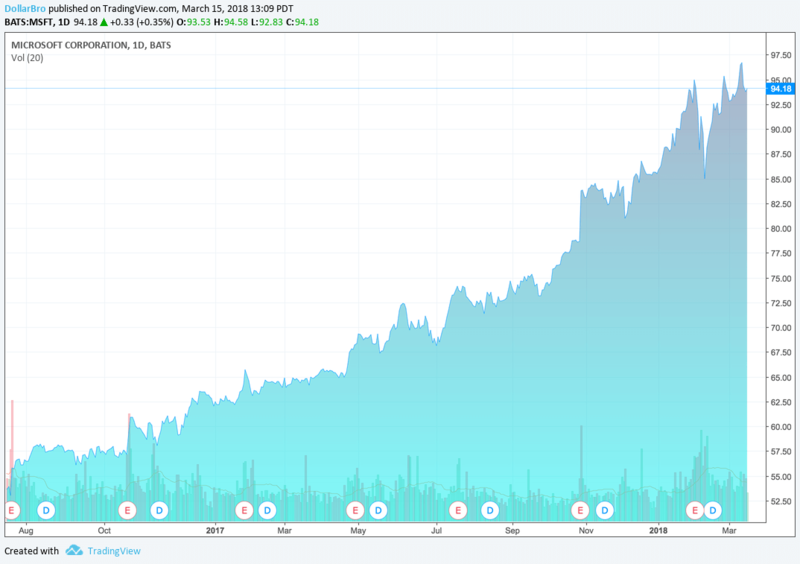 And, believe it or not, Microsoft fully recovered in just a few days after declining $10 per share and was right back to where it was before selling off. In general, this is why selling put options for income is a better investment idea than buying them. This particular Microsoft example is highly interesting for option sellers and buyers alike. Assuming a trader purchased out of the money Microsoft put options for the past six months, depending on the strike price selection, all of the put options would have expired worthless and the trader would not have made a single dollar. The only time a Microsoft put option buyer would have actually made money would have been during the world-wide stock market sell0ff in February, which was one of the rarest events in over a decade. With that said, even with an EXTREMELY rare selloff, the put option buyer would have STILL managed to lose money if they did not close out their position when the market was at the bottom, and this would have required insane market timing. Even though the put option buyer was right about the direction, they still would have had to be right about the timing, or the put options would have still expired worthless. Getting both of these aspects right is simply too difficult to do once, let alone consistently. Essentially, what we’re trying to say is this: buying put options necessitates uncanny market timing, which is something just about nobody in history has been able to consistently do. At the end of the day, markets are incredibly difficult to time, and this is why option sellers come out ahead. The best way to think of selling put options is like selling insurance. Every month, millions of Americans pay hundreds and sometimes thousands of dollars in insurance premiums to protect their houses, cars, health, boats, and countless other possessions. The fact that insurance companies can sit back and collect hundreds of millions of dollars every month is precisely why they are profitable. Of course, there will be a few unpredictable incidents where the insurance companies will have to shell out some money in a settlement claim, but on the whole, they always come out ahead – and if you think insurance companies don’t have every ounce of their business mathematically planed with actuaries, you’re dead wrong. If every American made an insurance claim for the full value of their insured assets tomorrow, the insurance companies would be completely out of business – but a situation like this is extremely rare if not impossible, and insurance companies are entirely aware of this; that’s why they sell insurance. Options function virtually the exact same way as insurance. There are tons of investors out there who want to (and sometimes need to due to institutional investor bylaws) purchase put options to protect their long stock positions. Investors who purchase options as a hedge want the options to expire worthless, because this means their original stock position is intact and likely profitable. More times than not, far out of the money options will expire worthless and options sellers will come out ahead, just like insurance companies. Getting the direction, magnitude, and timing right for a given stock might happen once or twice, but it certainly won’t happen month in and month out. It’s simply too difficult. So why do investors still buy options? As aforementioned, some need the insurance protection. However, a lot of investors a lured into buying options due to the “jackpot mentality.” That is, the idea that they can turn a very small amount of money into a large amount of money by being right just one time, i.e. winning a jackpot. In the real world, the jackpot mentality is a fallacy; it is not an investing strategy. It’s one thing to accurately predict the direction of a stock, but it’s a whole different ball game to accurately predict precisely when a stock will selloff and by how much. With this said, it’s far wiser to take the approach of the insurance company. That is, “I don’t really know for certain what will happen, but I know what the most likely outcome is.” And the most likely outcome is NOT a trader accurately getting the direction, magnitude, and timing of a future stock’s movement correct over the long tun. Keep in mind, the Microsoft example is just one example of selling put options for income on one stock. Options sellers can sell puts on indices, futures, currencies, and even commodities. There’s no need to limit yourself to just stocks. In fact, diversifying the assets on which you sell put options is actually a good idea. Under no circumstances do you want too much correlation to one specific asset, in case a disaster happens. For example, if you only sell put options on one stock, and that stock crashes, you could face some hefty losses. This would be analogous to an insurance company limiting itself to only selling flood insurance to residents of Louisiana – insurance companies simply don’t do it, because it’s foolish. Instead, they sell flood insurance to residents in every state. A flood or natural disaster will probably happen in one state every few years, but the probability of a flood in every state is so low that it’s almost zero. Insurance companies know this and are therefore willing to take everyone’s money. Similarly, sophisticated options sellers know that the probability of basket of uncorrelated assets declining and not recovering in a specific time window is extremely low, and they are willing to take the money from overzealous put option buyers.